An on-site bakery gives an advantage to this eclectic French café. Lunch & Dinner Tues.-Sun., Brunch Sun. 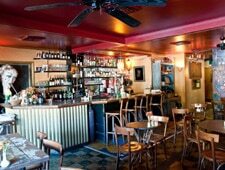 : Chez Lulu’s name derives from a French euphemism for a bordello. But this café is more gourmet-bohemian than red-light district. The red-and-gold themed setting with paintings lends a European feel that enhances the enjoyment of the food. Owner Carole Griffin offers sandwiches on rustic hearth-baked breads from her adjacent business, Continental Bakery. The breads make savory scoops for the olive tapenade, roasted red pepper spread, feta and farm egg on the Mediterranean sampler. La Doba a la Nissarda embellishes long-simmered beef with red wine and vegetables. Sherry-roasted beets make an eye-appealing plate with local arugula and squash, walnuts and citrus vinaigrette, as do Royal Red shrimp sautéed in a spicy pepper sauce, served atop peach grits with wilted mustard greens. Hand-tossed pizza includes one with Italian sausage and local goat cheese from Stone Hollow farm. The small, well-chosen and gently priced wine list complements the cuisine. Ask about the bread pudding du jour or go with the Callebaut Belgian chocolate and espresso pot de crème. For Sunday brunch, don’t miss savory and sweet crêpes, including ham with mornay sauce, fromage blanc with blueberry sauce, and chocolate-hazelnut.